Hadley’s Bar + Kitchen is home to one of my F A V O R I T E brunch (and lunch, dinner, late night drinks) spots. Each time I go in, I am never disappointed. The atmosphere, service and food are always on point. Makes sense as they are sister to another one of my favorite spots – Bodega, located in the Short North. If you aren’t sure of their location, they are located on one of the best streets in Columbus – Fourth St. Why is it the best street do you ask? Simple. It is home to some of my favorite spots. 16 bit. Little Palace. Late Night Slice. El Camino Inn. Dirty Franks. When you walk into Hadleys, you are immersed into an atmosphere with a modern, yet vintage, industrial vibe. At the front, high-top tables lead you toward an iconic Frisch’s Big Boy statue with a few upgrades – making him the perfect poster child for their restaurant. We were pleasantly surprised at how comfortable the bar stools were. Facing the alley, you will find a row of booths which almost serves as a separation between the front and back end of the restaurant. Love the bright blue to add a pop of color. I am a sucker for good lighting. LOVE this! Their brunch cocktail menu is simple, yet unique. They offer their version of the cocktail brunch staples – Bloody Mary & Mimosa, but, also add in two of their own brunch cocktails. 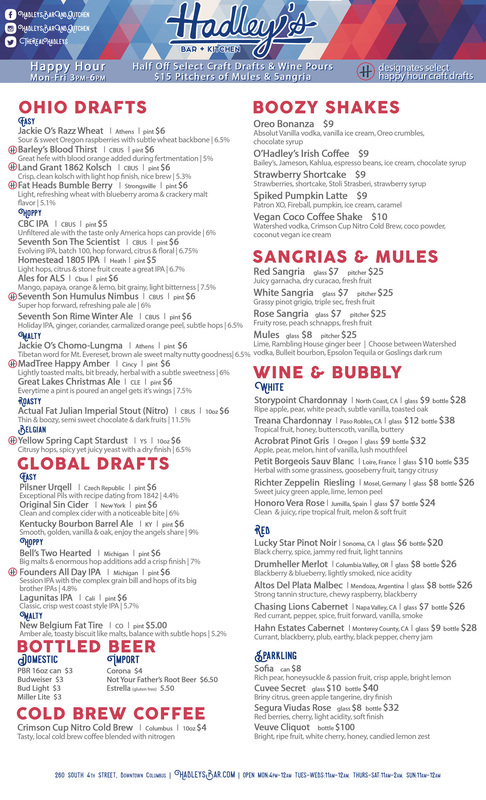 In addition to this menu, they do have a full beer and wine menu, as well as a full liquor bar. How do you make your mimosa? I am a ‘splash’ of OJ type of girl. Blood Mary Toppings. You can get a Bloody Mary or Maria (mild or spicy) for $8. You chose from Watershed vodka or Epsolon Tequila, house bloody mary mix and pepper spiced rim. While I am not a Bloody Mary (or Maria) fan, the girls at the table seemed to enjoy theirs. I do, however, love a good snack which makes me upset that I am not a fan! I am not sure where to even start with the food. I think I will have to let the pictures do all the talking. Just know that you’re sure to find the perfect palate-pleaser on their incredibly delicious menu which includes creative food, seasoned and cooked to perfection. Look at that golden deliciousness. Hadley Cheeseburger: American cheese, house brined pickles, and their specialty dijonnaise on a brioche bun. $12. Triple $14. Add Egg +$1. Add Bacon +$2. shrimp & grits: Pan seared shrimp served over stone ground cheddar grits in a creole tomato sauce. You can not leave without a boozy shake. Why choose between dessert or another drink when you can have both? Special thanks to Columbus Food Bloggers for setting this brunch up! Interested in collaborating on a meetup or becoming a member of the Columbus Food Bloggers group? Please email us at: cbusfoodbloggers@gmail.com.